So, I’m pretty much in love with this stitch pattern. As soon after surgery and the post operative wound infection I was able to pick up my crochet hook and scarf, this pattern was exactly where I went. 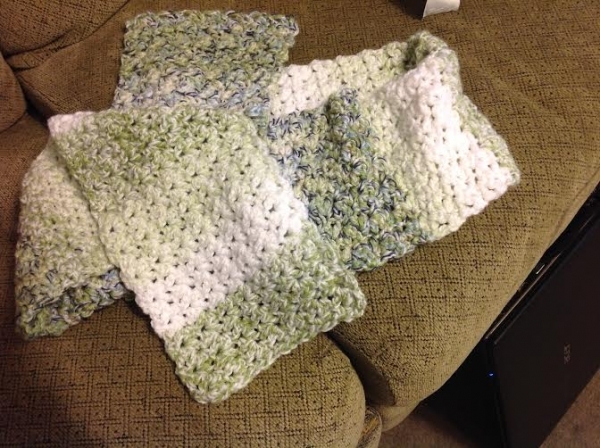 I grabbed 4 small skeins of yarn from my stash – two skeins each of mixed green variegateds – looked up this free pattern, and set about making a scarf. I actually wanted to make a baby afghan, but feared I didn’t have enough yarn to make one in my minimum size of about 36X36 inches. I really like the way this scarf turned out. It’s about 8 inches wide and over six feet long. The shades of green in the two skeins blended well as the pattern revealed itself. 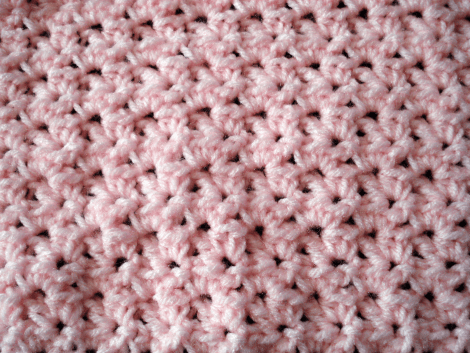 There are a couple reasons this stitch is so versatile and useful. First, it’s easy to remember. That’s a huge plus for me. Second, it works equally well with almost any size yarn. Third, it’s highly adaptable and works well for the original baby afghan, the shawl I made using the stitch, and now, a great scarf. Fourth, and finally, it produces a very soft, cushy feeling fabric. It’s very cuddly. Everyone wants to project as I’m working on it (as I crochet in public). Row 1. Chain 27, crochet in fourth stitch from hook (sc, hdc, dc), skip 2 stitches, [sc, hdc, dc in next stitch, skip 2 stitches] across to hdc in last stitch. Row 2. Chain 2, turn. In first dc of previous row (sc, hdc, dc), skip 2 stitches, [sc, hdc, dc in next dc, skip 2 stitches] across to hdc in last stitch. Row 3 and on: Chain 2, turn, repeat row 2 until your scarf is the length you want. Tie off and weave in ends. If you like my pattern, you’re sure to like the original project even more. Click here to get to it. And, if you want to see the shawl I made using this pattern, check it out here. The stitch pattern is so pretty! Did not find the pattern for either project.